Catalytic converters, Particulate Filters, Traps & Adsorbers, Substrates, Catalytic coatings etc. are used based on different engine technologies, applications, operating conditions, precious materials etc. Most modern cars are equipped with three-way catalytic converters. "Three-way" refers to the three regulated emissions it helps to reduce - Carbon Monoxide, Hydrocarbon and Nitrogen Oxides. 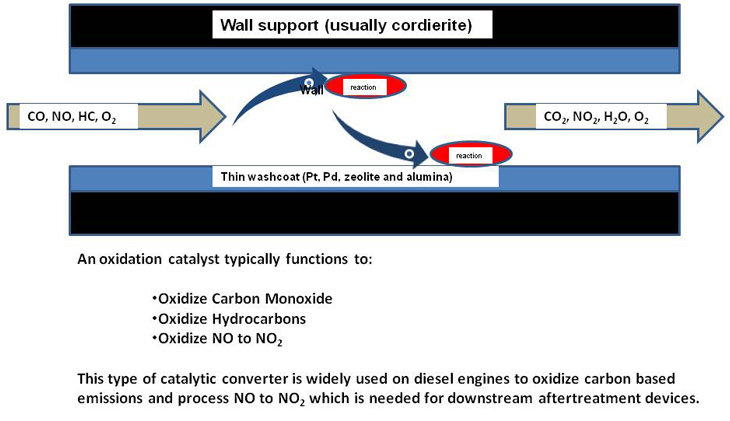 The converter uses different types of catalysts, for reducing and oxidizing the pollutants within a single monolith and an oxidization catalyst. Most cars today use a honeycomb structure. The oxidation catalyst reduces the unburned Hydrocarbons and Carbon Monoxide (CO) by burning (oxidizing) them over a Platinum and Palladium catalyst. The third stage is a control system that monitors the exhaust stream, and uses this information to control the fuel injection system. There is an oxygen sensor mounted upstream of the catalytic converter, meaning it is closer to the engine than the converter is. This sensor tells the engine control unit (ECU) the amount oxygen in the exhaust. The ECU can increase or decrease the amount of oxygen in the exhaust by adjusting the air-to-fuel ratio. This control scheme allows the ECU to make sure that the engine is running at close to the stoichiometric point, and also to make sure that there is enough oxygen in the exhaust to allow the oxidization catalyst to burn the unburned hydrocarbons and CO.
DOC’s reduce emissions of the organic fraction of particulate Matter (PM), gas-phase hydrocarbons and carbon monoxide. Diesel engines are lean-burn engines hence require oxidation catalyst alone.To reduce NOx in an oxidation rich environment requires new approaches. Selective Catalytic Reduction, Lean De-NOx catalysts and NOx adsorbers are technologies that can be used in these lean applications. It is a device that is used to reduce oxides of nitrogen (NO and NO2) emissions from a lean burn internal combustion engine. The NOx adsorber was designed to avoid the problems that EGR and SCR experienced as NOx reduction technologies. The theory is that the zeolite will trap the NO and NO2 molecules - in effect acting as a molecular sponge. Once the trap is full (like a sponge full of water) no more NOx can be absorbed and it is passed out of the exhaust system. Various schemes have been designed to "purge" or "regenerate" the adsorber. Injection of diesel fuel (or other reactant) before the adsorber can purge it, the NO2 in particular is unstable and will join with hydrocarbons to produce H2O and N2. Use of hydrogen has also been tried, with the same results, however hydrogen is difficult to store. Some experimental engines have mounted hydrogen reformers for on board hydrogen generation; however fuel reformers are not mature technology. The new clean diesel system involves three pieces: cleaner diesel fuel, lower-emitting diesel engines and advanced emissions control devices. Selective Catalytic Reduction (SCR) is one of the latest technologies designed to further reduce emissions of nitrogen oxides and to meet stringent new air quality regulations. Selective Catalytic Reduction is a technology that injects urea – a liquid-reducing agent –into the exhaust stream of a diesel engine. The urea sets off a chemical reaction that converts nitrogen oxides into nitrogen and water in the catalyst, which is then expelled through the vehicle tailpipe. While urea is the primary operating fluid presently used in SCR systems, alternatives to the urea agent are currently being explored. One option involves the use of diesel fuel to transform NOx into harmless gases. SCR technology is one of the most cost-effective and fuel-efficient technologies available to help reduce emissions. SCR can reduce NOx emissions up to 90 percent while simultaneously reducing HC and CO emissions by 50-90 percent, SCR systems can also be combined with a diesel particulate filter to achieve even greater emission reductions for PM. SCR technology may play a key role in achieving emissions reductions that allow light-duty diesel vehicles to meet the most stringent emission regulation to be phased in US, Europe and Japan. SCR has been used to reduce stationary source emissions since the 1980s. In addition, more than 100 marine vessels worldwide have been equipped with SCR technology, including cargo vessels, ferries and tugboats. While SCR has been installed on both highway and non-road engines in diesel retrofit demonstration projects throughout the U.S., SCR systems have become the technology of choice for many of Europe’s heavy-duty diesel truck and bus manufacturers where the urea agent is commonly known as Ad Blue. SCR technology may become more prevalent in the United States as both light and heavy-duty engine manufacturers work to meet future emissions reduction standards starting in 2009. In fact, several light-duty diesel manufacturers have already indicated that they are considering the use of SCR in future products. Lean De-NOx Catalysts, also known as hydrocarbon-SCR systems use different catalyst to reduce NOx; Hydrocarbon like Ethanol or diesel is dosedin order to create a rich 'microclimate' reduction of NOx happens, while the overall exhaust remains lean. Gasoline Direct Injection (GDI) is a key technology of gasoline engine development to reduce CO2 emissions while improving torque and power output. 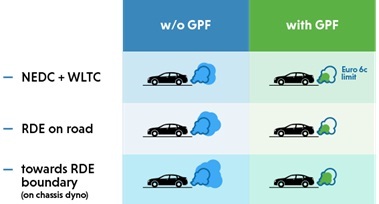 However the drawback of GDI engines is an increase in particle number (PN) emissions compared to conventional Port Fuel Injection (PFI) engines. Most of the GDI particles are formed during the cold-start phase, catalyst heating mode and dynamic engine modes. Therefore, the injection system including injection operating programme (e.g. number of injections, timing, and amount of injection) has been further developed in order to improve air-fuel mixture in the cold-start phase. Furthermore, internal engine measures such as improved mixture homogenization and minimized amount of injected fuel striking the walls helps to avoid the formation of particles. Thus, latest GDI vehicles can achieve the PN limit of 6×1011/km on the regulatory test cycle (NEDC or WLTC). The RDE procedure however also includes particle counting in a wide range of engine map operation. The Gasoline Particulate Filter (GPF) technology has been derived from successful experience with DPF and is available. It ensures control of ultrafine particles from Gasoline Direct Injection engines under real-world driving conditions. It has been known for a long time and is a well-proven and effective means of reducing NOx emissions from internal combustion engines. It has been used on both spark ignited and diesel engines EGR systems can be implemented with either open or closed loop control systems. In open loop systems, EGR valve position is set based on engine speed and load. While extensive calibration is needed to determine the correct valve position, there is no feedback signal to determine if, over time, the commanded valve opening is continuing to provide the correct amount of EGR. Closed loop systems use a feedback signal, commonly from a sensor that determines the actual valve position or from a flow meter in the EGR line, to provide an error signal that allows corrections to be made to the signal that drives the EGR valve so that any unexpected changes in EGR flow can be corrected. Closed loop systems are critical for the most stringent emission standards where even small changes in EGR flow can cause NOx emissions to exceed regulated limits. A device which physically captures diesel particulates prevents their discharge from the tailpipe. Collected particulates need to be removed from the filter, usually by continuous or periodic oxidation in a process called “regeneration”. Wall-flow diesel particulate filters usually remove 85% or more of the soot and under certain conditions can attain soot removal efficiencies approaching 100%. 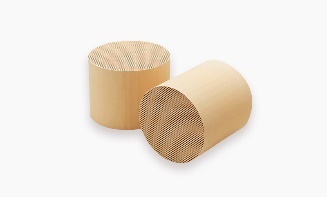 In wall-flow filters, the exhaust gas flow is forced, together with the corresponding particulate matter, through a porous filter wall, effectively filtering out particulate matter. 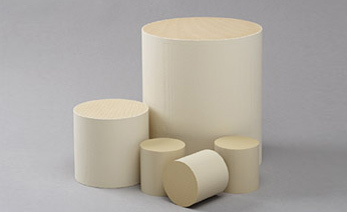 Partial flow filters work according to the principle of partial flow deep-bed filtration. Structural elements are used to divert part of the exhaust gas flow through a fiber fleece and into the filter's adjacent channels, effectively filtering out particulate matter. Due to the way they work and their reliability, partial flow deep-bed filters are used mostly for retrofitting purposes they do not have to be regenerated on a regular basis, as they depend on continuous regeneration alone. Moreover, they cannot become clogged and damage the engine or cause a fire as a result. Metal foils with scoop-shaped wavy plies guide diesel exhaust gas through a metal fiber fleece. High reduction of HC/CO emissions. PM conversion in heavy-duty engines usually limited to maximum 20-30%. Widely used on Bharat Stage 2/3/4 Passenger cars will remain a component of future emission control systems. Increasing use in Bharat Stage 4 cars (mostly voluntary). Expected to be used on all Bharat stage 5 cars. In combination with cleaner engine-out emissions, flow-through filters may replace wall-flow particulate filters. First commercial application in selected (EGR-equipped) Bharat Stage IV heavy-duty truck engines. Uncertain; NOx reduction potential insufficient for long-term regulatory objectives. May see application as alternative diesel combustion strategies evolve. A temperature sensor gathers data concerning the temperature from a source and converts it to a form that can be understood either by an observer or another device. It warns of temperature excursions above the safe operating temperature of the catalytic converter. More-recent catalytic-converter designs are not as susceptible to temperature damage and can withstand sustained temperatures of 900 °C (1,650 °F). Temperature sensors are also used to monitor catalyst functioning: usually two sensors will be fitted, with one before the catalyst and one after to monitor the temperature rise over the catalytic-converter core. The oxygen sensor is the basis of the closed-loop control system on a spark-ignited Stoichiometric - engine; however, it is also used for diagnostics. In vehicles with OBD II, a second oxygen sensor is fitted after the catalytic converter to monitor the O2 levels. The O2 levels are monitored to see the efficiency of the burn process. The on-board computer makes comparisons between the readings of the two sensors. The readings are taken by voltage measurements. If both sensors show the same output or the rear O2 is “switching”, the computer recognizes that the catalytic converter either is not functioning or has been removed, and will operate a malfunction indicator lamp and affect engine performance. Simple “oxygen sensor simulators” have been developed to circumvent this problem by simulating the change across the catalytic converter with plans and pre-assembled devices available on the Internet. Although these are not legal for on-road use, they have been used with mixed results. Similar devices apply an offset to the sensor signals, allowing the engine to run a more fuel-economical lean burn that may, however, damage the engine or the catalytic converter. NOx sensor is typically a high-temperature device built to detect nitrogen oxides in exhaust system environment of automobile. The sensors can be incorporated upstream and downstream of the catalyst, for example, to provide a feedback control loop to the Engine Control Unit (ECU) of the exhaust emission system. The ECU can than make adjustments to optimize NOx conversion performance. Potential applications of NOx sensors as NOx emissions reduction technology for meeting increasingly strict exhaust gas regulations. It monitors NOx concentration downstream of NOx adsorber catalysts to control NOx adsorber catalyst regeneration; NOx concentration before and after selective catalytic reduction (SCR) to control and optimize urea injection and also works as NOx-OBD, a self-diagnostics by sensor and unit to identify wear in catalysts and other components. It can be applied to gasoline lean burn engines as part of a broader engine control or diagnostic system used to insure proper operation of the NOx emission control system. The rate at which the catalyst heats up is an important factor in the control of the start-up emissions of an engine. The beneficial impact on reducing cold start emissions via thermal management has led to numerous improvements to the exhaust system components up stream of the converter in order to retain as much heat as possible in the exhaust gases. A number of measures have been used to improve this such as Moving the catalyst closer to the exhaust valve outlets - close coupled; Insulation of the exhaust manifold; Insulation of the downpipe; Insulation of the catalyst. Exhaust system manufacturers have been working together with catalyst companies to develop ways to heat up the catalyst as quickly as possible. 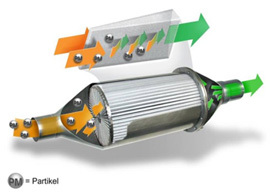 A catalytic converter thermal management system (TMS) using variable-conductance vacuum insulation and phase-change thermal storage can maintain the converter temperature above its operating temperature for many hours, thus having minimal "cold-start" emissions.